Calgary’s failure to make Amazon’s short list of locations for its second headquarters is a disappointment but also a learning experience, says the woman who spearheaded the city’s pitch to the U.S. tech giant. Calgary's failure to make Amazon's short list of locations for its second headquarters is a disappointment but also a learning experience, says the woman who spearheaded the city's pitch to the U.S. tech giant. 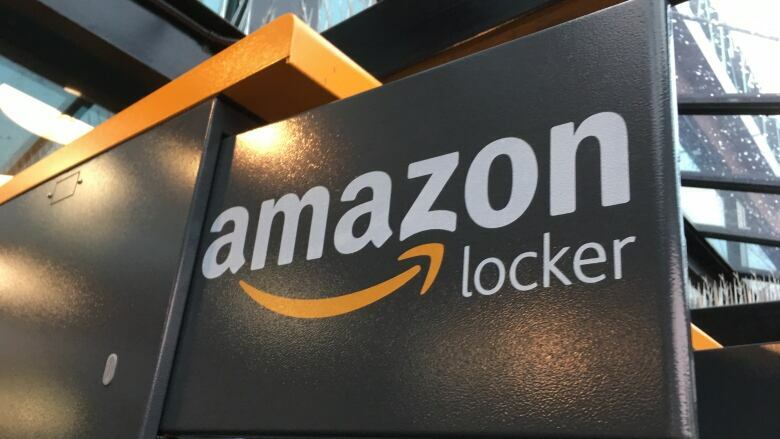 The world's biggest online merchandise retailer received 238 applications from North American cities hoping to be selected for the Seattle, Wash.-based company's second main office — including more than 10 Canadian submissions. Amazon announced Thursday it has whittled the list down to 20. The only Canadian city to make the list is Toronto. "I was surprised that we weren't on the list, there's no question about it," said Mary Moran, CEO of Calgary Economic Development, which submitted Calgary's bid. "But you know, we have so many files and some other big companies that we're working on right now, that … I don't think anybody should give up." Moran said the process revealed some weaknesses in terms of the technical skill set available in Calgary to attract big tech sector employers such as Amazon. "We only produce 176 computer science grads out of Calgary every year," she said, adding that Calgary needs to figure out how to help the engineers of yesterday become the engineers of tomorrow. "I think we can learn a lesson from some of the cities that got on." Moran noted that Denver — a city that has ridden the highs and lows of the energy sector much like Calgary — did make the cut, perhaps in part because it has managed to diversify its economy by attracting tech companies. "I would say the only message I have is we have to move faster," Moran said. Amazon officials offered to conduct a debriefing session with Moran about Calgary's bid, which she said would be useful for future efforts to attract major employers. Amazon has said the location for its second headquarters would bring 50,000 high-paying jobs and $5 billion worth of investment. Craig Patterson, director of applied research at the University of Alberta's School of Retailing, said the project may have been a bit too big for Calgary to handle. "I think this would have been a challenge for Alberta to absorb," Patterson told Alberta@Noon on Thursday. Patterson said the city could have seen a significant increase in real estate prices or perhaps even a labour shortage. He pointed to the lack of a strong downtown in Calgary as one of the reasons the pitch might not have been accepted, but he still pointed to it as a success. "This was definitely a publicity stunt to some degree," he said. "This was a terrific exercise in civic awareness and for cities to look at what they have and what they can improve on." "I think Calgary won in that respect. Certainly from a publicity standpoint, it's getting some international recognition." Premier Rachel Notley said Amazon officials told her the bids from Alberta's two biggest cities were both well received, but particularly Calgary's. "And they actually said very, very good things about it," she said. "And they said they've got a whole new idea of Alberta and that Calgary did an excellent job." 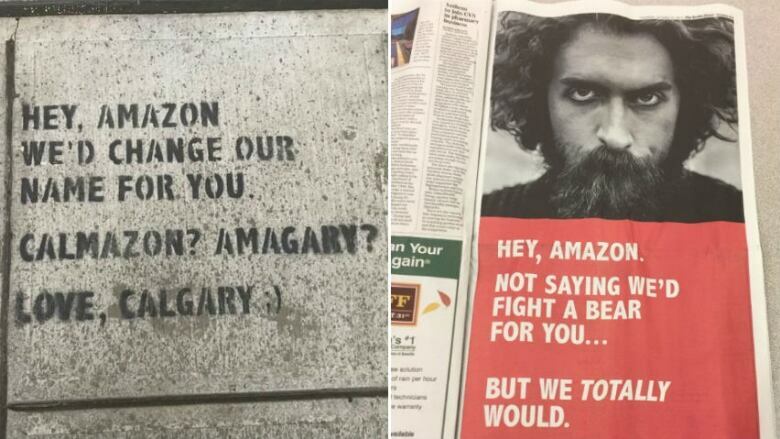 As part of Calgary's pitch, Calgary Economic Development put up a tongue-in-cheek billboard in Seattle that said "Hey, Amazon. Not saying we'd fight a bear for you... But we totally would." Alberta Party Leader Greg Clark and Calgary Coun. Evan Woolley shared their thoughts on Calgary Economic Development's campaign on Twitter. The campaign got local tweets and wider notice, including mentions in the New York Times. "I think Calgary's got to hold its head up and really feel proud about what they put forward, because we did get attention," Moran said. Calgary's bid also touted the city's low crime rate, its "dark-fibre" network of high-speed digital connectivity, vast amounts of available downtown office space, a talented workforce and world-class recreational opportunities. "As far as the folksy thing, we made a conscious decision to do that," she said. "You know, that's Calgary. We didn't want to talk about something we're not. We're not Toronto," Moran said. The next step in the selection process will be to take a "deeper dive" into the proposals by the remaining cities in the coming months and evaluate the feasibility of a future partnership, said Amazon.